OEM fuel rail arrangements are limited in performance. The Cosworth High Volume Fuel System features high volume anodized fuel rails, with o-ringed fittings and is fully configurable for various applications. Each system includes sleeved high pressured fuel lines along with a CNC machined distribution block that includes an additional port for various sensors. 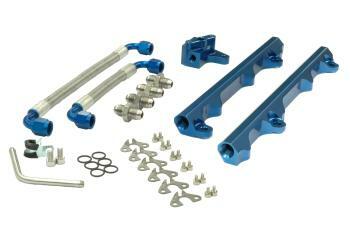 The Cosworth High Volume Fuel Rail System can be used with original or various aftermarket injectors.